To Know God, to Live with Honor, to Change the World. It is our goal that your four years with us will be your own personal advent. We want for you to discover the greatness within and to realize your potential for leadership. We will do all possible so that on your graduation day, we will be sending forth the person that you have been awaiting and it will be a momentous occasion! We pledge our hearts and honor. Of the good old Silver and Blue! 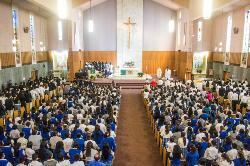 St. Genevieve is a Catholic, coed high school in Panorama City, in the heart of the San Fernando Valley. We were founded in 1959 and named after Saint Genevieve, a fifth century nun whose prayers saved Paris from an invasion by Attila the Hun. St. Genevieve High School prepares students for their future by providing a quality academic and moral education. Our small environment gives our teachers, coaches and administrators availability for one-on-one attention to every student. No one gets lost on campus; nobody falls through the cracks in our classes. St. Genevieve graduates aren't only ready for college - they're prepared for life. Our alums are responsible, Christ-centered citizens. They're effective communicators, technology users and collaborative workers. They're critical thinkers, problem solvers and lifelong learners. In short, they're young men and women of character prepared to lead. Many urban high schools have focused resources on adding metal detectors, surveillance cameras and even armed guards. We've chosen a radically different path. At St. Genevieve, the whole goal is to make the school experience inclusive for all students by fortifying their hearts as well as their minds and creating a campus that values every student. Hazing of incoming freshmen is unacceptable at SGHS. 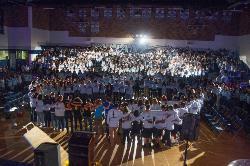 In fact, juniors and seniors go out of their way to make freshmen feel welcomed by our special "Valiant Spirit" from the moment they step on campus and become part of the school community.